Our drive to Marrakesh took us down a very normal highway, like anything you'd see in the US, so we opted to go off the main road and take a more scenic route. This lead to our only road trip hiccup, a flat tired. Pulled over in a gas station while examining our rental car's spare a rusty van rolled up. Two moroccan's jumped out gestured at the spare and started swapping out our tired for us. After a round of hand shakes the two men drove off and we realized they'd only stopped to help us. This generosity we saw time and time again throughout Morocco. Arriving in Marrakesh our place for the night Riad Malika met us at our car and helped shuffle our bags down the winding streets of the medina. Riads are traditional Moroccan homes with a central courtyard filled with plants, ours did not disappoint. Inside our bags were whisked away upstairs until we reached the roof. 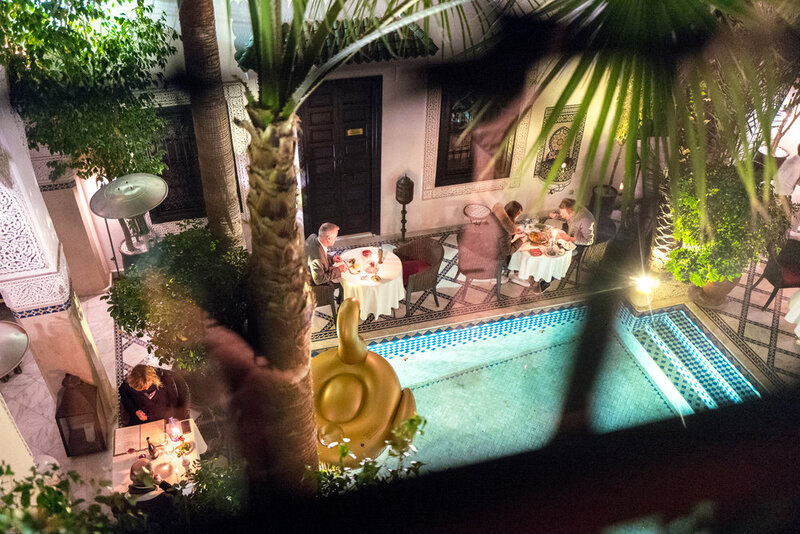 Past the sprawling view of Marrakesh was our own private room with personal balcony. We were floored, a perfect spot to call home while exploring. The stay only got better with an excellent breakfast on the roof of fresh bread, jams, and coffee. 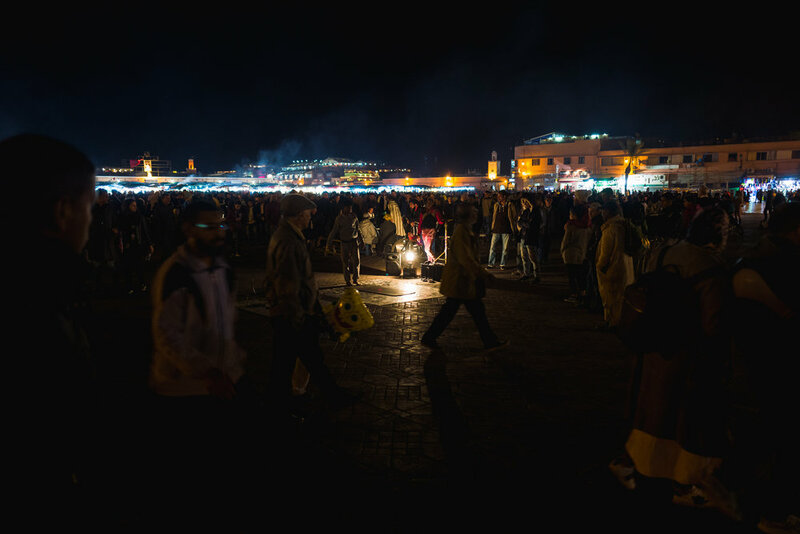 The heart of Marrakesh is it's medina, the market place. In this maze of narrow streets you can find almost anything. Shop upon, shop upon, shop selling rugs, tagines, cookwares, shoes, spices, you name it. Getting lost is a given, Google Maps tried it's hardest but surprised dead-ends or connections were numerous. This place is chocked full of photographic inspiration. Our advise is to clear your camera card off, charge your batteries, get lost, and take photos endlessly. Locals might expect a few dirham here or there for tours or photos, so carry some smaller bills or coins to avoid issues. Don't be afraid to tag along with a local who wants to show your around, we got a lovely private tour of the tanneries this way. They'll ask for money at the end, but exchange rate in mind and the awesome experience we feel exploited. 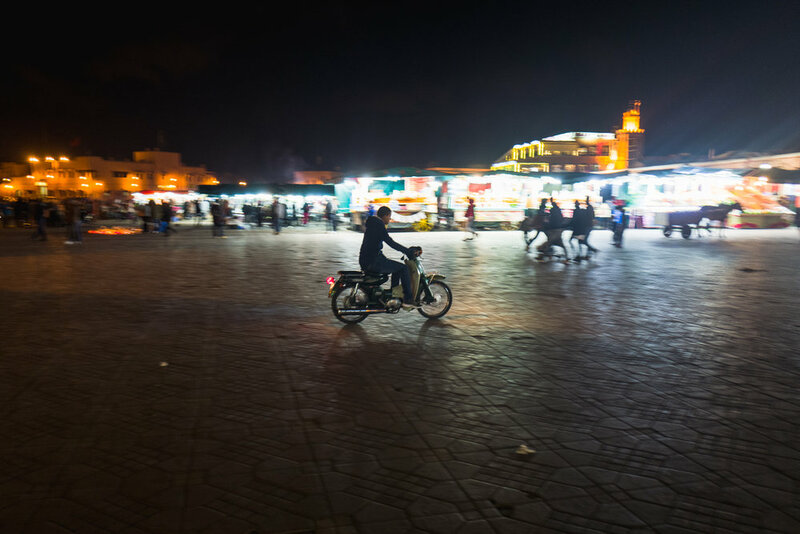 While wandered the medina we were continually chased by the call "Alibaba!". We'd ignored it until meeting another American in a restaurant. "Do they call you Alibaba too? I think it's the beard". He'd been hounded by everyone on the street because of his beard just me. It wasn't until later in the trip did we learn that a famous movie version of a 1,001 Arabian Nights featured a large bearded Alibaba. The name would persist throughout the rest of our trip, shouted from down the street, and other times whispered with destain when negotiating prices. The garden of Yves Saint-Laurent's Moroccan home. This place is beautiful but often over run with tourists. The line for the garden is insane, but the trick is to go to the YSL museum down the street and get tickets for both, then you can skip the whole line. A huge square full of food stalls, juice stands, and pop up music groups. This place is intense, but worth a walk through. When you arrive a group of guys will offer you tours, though you can walk around on your own, taking them up on the tour gives you the backstory on the tanning process and fresh mint you'll want for the smell. Ask for the price upfront so you don't get surprise ripped off. This is a small housewares store in the bottom of Nomad. We picked up classic moroccan tea glasses from here. Stop by here after Jardin Majorelle for some modern moroccan goods. The second riad we stayed at on the way back to Casablanca. We had a great dinner with a local wine here. The courtyard pool looks amazing even though we didn't dip in. To end our trip we had a hammam spa treatment here, highly recommended.